After a hectic winter season filled with various events and extreme weather, we're looking forward to warm weather and a renewed sense of purpose in 2015. 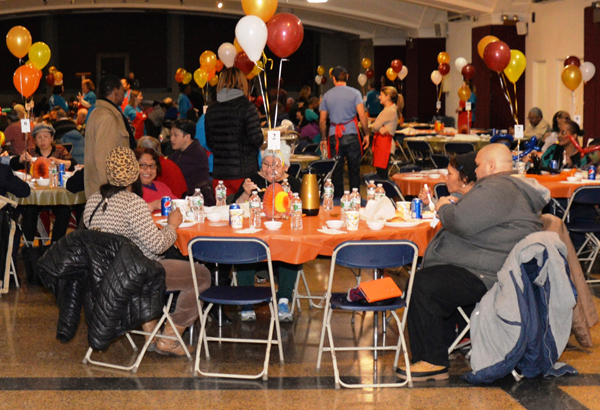 We kicked off January by hosting an Annual "Dinner for the Needy" at the Church of St. John the Baptist in Manhattan. All were welcome to partake in the free and hearty meal. Once again, BNP Paribas participated in a CAN-opoly tournament where they were challenged to build a NYC landmark using canned goods. 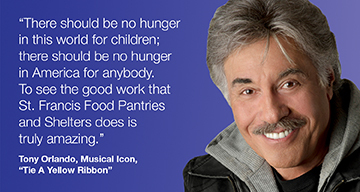 In the end over 2,200 cans of food were donated to a food pantry we provide support to in Brooklyn, New York. Valentine's Day was sweeter than usual for hundreds of seniors at Encore Community Services as we hosted our Annual Valentine's Day Party sponsored by Interpublic Group! Although the holiday season has come and gone, the "spirit of giving" was alive and well on a brisk Saturday afternoon in February during our Annual "Thanksgiving in February" lunch. Over 500 our food pantry clients attended and were served at this festive event. Mary Anne Fusco of Town Real Estate held her annual Coat Drive, which yielded hundreds of coats and cold weather accessories, on our behalf. In addition, our friends from Disney recently donated an array of kitchen appliances (that were gently used on network TV's "The Chew"). We are looking forward to upcoming new projects, annual fundraising events and to connect with even more supporters and people in need of our services. Here is to working together in 2015 and accomplishing even more than ever! Be sure to connect with us on social media: Facebook, Twitter, Instagram for all things #StFFP!